LAFM TV Show! 13th Season! Episode 14 Now Available On YouTube! January 16, 2019	Comments Off on LAFM TV Show! 13th Season! Episode 14 Now Available On YouTube! LAFM TV 13th Season! Episode 15! January 16, 2019	Comments Off on LAFM TV 13th Season! Episode 15! Check out this week's show featuring former Tennessee/Nicholls State linebacker John Emery Sr., his son Destrehan senior RB/LSU signee John Emery Jr., Leesville Head Coach Robert Causey, and Leesville senior OT/Nebraska signee Matthew Anderson! LAFM TV 13th Season! Episode 14! January 8, 2019	Comments Off on LAFM TV 13th Season! Episode 14! We have a great show lined up this week featuring two Louisiana football legends. For more information, please click the link above! 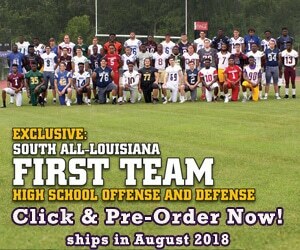 After making his picks for our Road to the Dome segments, Louisiana Football Magazine's recruiting guru Lee Brecheen gives his final take and analysis on all of the state championship games!